The Arctic tern is a medium-sized seabird, white with a black head and a bright orange beak. It has long, slender wings, and is an elegant flyer, but its legs are short which makes it clumsy on the ground. Its diet consists of small fish, insects and invertebrates. Arctic terns have been known to live 30 years or longer and their current population is estimated at about one million. The Arctic tern is nature’s ultimate commuter. This seabird migrates from its northern breeding grounds in Iceland and Greenland to the Southern Ocean around Antarctica and back, seeing two summers each year. This circumpolar trip of about 70,000 km is the longest yearly migration in the animal kingdom. Over the course of its lifetime, the Arctic tern flies a distance six times greater than the distance from the Earth to the Moon. Starting its trip in August, it pauses for a month in the mid-Atlantic Ocean where it fuels up on a rich supply of fish before continuing on to its winter habitat in Antarctica, arriving in December. In spring it returns north to Iceland and Greenland to nest. Once it has nested it starts out on another long southern migration. While flying long distance, the Arctic tern is able to put half of its brain to sleep while the other half remains alert and functioning. This is call unihemispheric sleep—the bird will actually sleep with one eye open and half of its brain awake, and it is able to use this ability at will. Arctic terns live together in colonies of about 50 birds. The male tern will court a female by taking a small fish in its bill and making a low pass over the female on the ground. If successful in attracting her attention, she will join him in this “fish flight” and they will soon mate. Both parents help incubate the eggs which hatch about 23 days after being laid. Chicks will leave the nest and hide from predators in nearby vegetation. The parents catch small fish for the hatchlings until they can feed themselves, but in recent years up to 90 percent of the tern chicks have died from hunger when food sources are not plentiful. Arctic terns are not fond of swimming and will do everything possible to stay out of the water. They hardly ever land. Most of the time they eat while flying, either swooping down to catch their fish, or catching insects on the wing. northbound migration indicated by the white line is more than twice as fast. 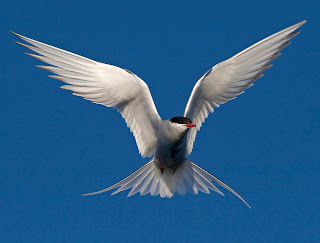 1) True or false: The Arctic tern sees more sunlight in a year than any other creature on Earth. 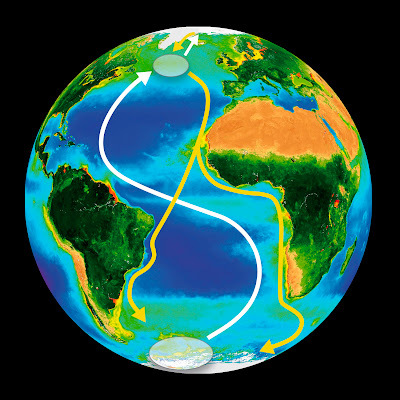 2) A migration that includes both the Arctic and Antarctic regions is known as __________. 3) True or false: Arctic terns, while clumsy on land are excellent swimmers. 4) “Fish flight” refers to the Arctic terns’ _____________. a) ability to catch fish during flight b) mating ritual c) migration d) both a) and c). 5) The ability of terns to sleep with one eye open and half of their brain awake is called ______________________ sleep.